On Saturday, the Oak Park & River Forest Huskies completed their regular season slate -- at three different locations. As we reported previously, the Varsity squad will compete in the February 3 Leyden Regional. This regional is the first step of the IHSA State Series. The three West Suburban Conference tournaments were held at Hinsdale South (Junior Varsity), at York (Sophomore), and at Lyons Township (Freshman). At Hinsdale South, the Huskies subdued the field in taking the top spot of 12 teams. With 234.0 points, the Orange & Blue outpointed top contenders Downers Grove North (134.0) and Morton (129.0). In all, OPRF entered 16 Junior Varsity wrestlers in the tournament. Here are the names, along with the weight class: Conor Nagela (106), Kylen Peace & Lila Stratman (120), Max Walton (126), David Deyro & Taigue Thurston (132), David Brodnax (138), Chance Phillip (145), Kedrick Bryant (152), Danny Lingen (160), Cam Bates & Ibrahim Mokhtar (170), David Smith & Cam Rigden (182), Jaylen Pascascio & Talvin Gibson (220). 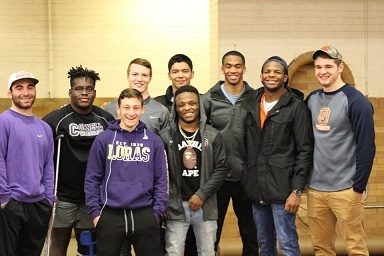 Of these, half earned top honors in each respective weight class: Conor Nagela, Max Walton, Taigue Thurston, Kedrick Bryant, Danny Lingen, Ibrahim Mokhtar, David Smith, and Talvin Gibson. Congratulations, grapplers! Excellent wrestling was on hand in Darien's Hinsdale South campus. All of our wrestlers should be extremely proud! The Sophomore and Freshman tournament results have not yet been reported. We will update as soon as possible. IHSA Saturday | A preview will come later this week, but be reminded that Saturday will hold OPRF's first postseason test. Varsity travels to Leyden for the IHSA regional. The action begins at 9:00 am. The medal round is listed at 1:00 pm. OPRF must win that regional to continue in the state's dual team tournament. In watching Saturday's annual home tournament, spectators often have mixed emotions. On one hand, the event traditionally marks the end of Varsity's regular season competition. It is a reminder that the season calendar is finite, and there are precious dates and events remaining. On the other hand, fans may feel excited in this two-week buildup to the IHSA State Series and may begin to ponder lineups, matchups, and stories yet to be written on bigger and bigger stages. While the non-Varsity levels have another weekend of competition, your Varsity Huskies completed theirs in style with a team triumph in the dozen team OPRF Invite. The Huskies also fielded a Junior Varsity lot in this tournament (they finished 11th). Overall, the Orange & Blue earned brackets in the lightest and heaviest weights. Jake Rundell earned top honors at 106 pounds while Ashford Hollis scored gold at 285 pounds. In order of finish, the Varsity squads for Saturday's tournament included OPRF (209 pts), Christian Brothers-MO (166.5), Minooka (145.5), Huntley, Arrowhead-WI, Crystal Lake Central, Dakota, Plainfield East, Plainfield Central, Urbana, OPRF JV, and Crystal Lake South. Eight Huskies earned 2nd-place results: Josh Ogunsanya (113), Eddie Bolivar (132), Torry Early (138), Eddie Ordonez (145), Joe Chapman (152), Danny Lingen (160), Daemyen Middlebrooks (170), and Brian Ziech (195). Huskie fans were seeing double as the Freshman team also stormed to their respective title. Concurrently at 201 N. Scoville, Oak Park & River Forest's youngest group downed fourteen other contenders: OPRF (143 pts), Huntley (120), Notre Dame (117), Riverside-Brookfield (117), Crown Point-IN, St. Rita, Taft, Morton, Niles West, Evanston, Maine West, Loyola, Christian Brothers-MO, Reavis, and Crystal Lake South. The lone home champ was Adrian Palmares at 195 pounds. Still, the Orange & Blue Freshman Crew earned several places included five runner-up finishes: Zavien Stewart (99), Sam Deyro (120), Nyle Pascascio (132), Spencer Soodan (145), and Nigel Bakuuba (160). Once again, the staff and "crew" worked tirelessly to ensure that the home tournament eased along as well as possible. We sincerely thank all of those who were involved in this joyous affair. Below are the individual results of the Huskie Varsity, Junior Varsity, and Freshman challengers. Remember, don't forget to check out the photos! Conference calling | On Saturday, the lower levels will have their conference championships. For a list of who is going where, please refer to our Schedule page. Home is where the heart is, and on Thursday night the Huskies honored many who help make the halls and history of OPRFHS special. First, let us discuss the action under the lights and comfort of the Field House. The Orange & Blue Wrecking Crew came out firing on all cylinders and earned victory in 13 of the 14 Varsity bouts. Hinsdale Central was the sixth (and final) conference opponent of the Huskies for the 2017-2018 season. The 65-3 triumph handed OPRF its seventh straight West Suburban-Silver Conference title, and tenth out of the last eleven campaigns. The Scoville Scurriers finish the regular season dual slate with a record of 23-2, 6-0 in conference. Providing a Leyden Regional victory, the Huskies will aim to improve upon that tally. Bonus points were flying for the home squad as there were four falls from 106 pounds through 126. Huskies added two more pins and also earned a trio of technical fall wins. Hinsdale Central's lone bout victory came at 145 in a tight-as-nails match which went into overtime. Eddie Ordonez fought hard but lost 2-1. Outside of that hiccup, all other Huskie wrestlers raised their arms in success. Beginning at 152 pounds and wrapping around to 138, OPRF conquerors were Joe Chapman, Danny Lingen, Daemyen Middlebrooks, Jake Cagnina, Elijah Osit, Talvin Gibson, Ashford Hollis, Connor Nagela, Jake Rundell, Josh Ogunsanya, Max Walton, Eddie Bolivar, and Torry Early. Respecting the excellence | Thirty years ago, there was some pretty dynamic wrestling that took place at 201 N. Scoville. In fact, the 1987-1988 OPRF wrestling team laid waste to opponents and made the championship dual. To honor the 30th anniversary of the 2nd place finish, coaches and athletes reunited around that state trophy. Congratulations! Remember, "Once a Huskie, always a Huskie." In another outpouring of recognition, several teachers and staff were honored. On many of the shirts read the words, "I SUPPORT A HUSKIE WRESTLER." We thank all of our very influential teachers and members of staff who shape our lives daily. 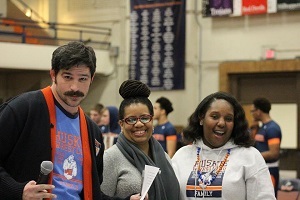 What a very exciting night it was at OPRF High School! On Thursday, January 11, the Huskies made quick work of the visiting York Dukes. The conference victory pushed OPRF to 5-0 in West Suburban (Silver) Conference play; the final score was 75-6. Several in the orange and blue singlet produced six-point wins for their club: Jake Rundell (113), Josh Ogunsanya (120), Eddie Bolivar (132), Torry Early (138), Eddie Ordonez (145), Joe Chapman (152), Danny Lingen (160), Jake Cagnina (182), Brian Ziech (195), Jaylan Pascascio (220), and Ashford Hollis (285). This past Saturday, OPRF made friends with Marmion, Crystal Lake Central, and Hononegah while at the Sandburg Super Duals. The Huskies scored wins over all three: 42-27, 57-12, and 57-12 respectively. On the day, Oak Park and River Forest featured six 3-0 grapplers: Josh Ogunsanya (120), Torry Early (138), Eddie Ordonez (145), Joe Chapman (152), Danny Lingen (160), Daemyen Middlebrooks (170). OPRF is now 22-2 overall and 5-0 in conference. Looking ahead | The Orange & Blue Wrecking Crew are in action again on Thursday and Saturday. On January 18, the Huskies host Hinsdale Central with a chance to finish the conference slate unbeaten at 6-0. On January 20, the Huskies again play host to a one-day tournament. The Huskie Invitational always showcases some tough teams and wrestlers in the area (and sometimes not). On Sunday, January 21, do not forget that the Little Huskies take over the OPRF Field House for the annual Susan P. Collins Memorial Tournament. This youth wrestling event will be an exciting kind of busy, and the entire OPRF and LH Wrestling Families anticipate a huge success for all participating and working the event. Coming into this tournament, the Huskies knew that the Montini Broncos were a part of the field. Yes, these are the same Montini Broncos who bucked the competition at The Clash just one week ago. Yes, these are the same Montini Broncos who are ranked top ten nationally. (If you don't recall, Montini is also an Illinois school.) OPRF also knows that it wrestles Huskie tough and will leave everything out on the mat. Well, the Huskies did very well for themselves as they laid claim to the runner-up position. Keep in mind that this was a 32-team tournament. Looking at the scoreboard, Montini earned first place with 806 points. In second was OPRF with 481. Finishers 3-5 included Apple Valley-MN (440), Southeast Polk-IA (436), and Kasson-Mantorville-MN (421). All others failed to reach the 400 point plateau. Jake Rundell was the lone champion for the Orange & Blue. Congratulations, Jake! His one-point victory kept him undefeated at 106 pounds on the season. Also finishing in the top five were Josh Ogunsanya (113, 4th), Eddie Bolivar (132, 5th), Eddie Ordonez (145, 5th), and Jack Fisher (160, 4th). Full team results are below. While the final places may be telling, they also may not. The tournament format is a little funky. Brian Ziech (220) finished with a 4-1 record, but somehow he also finished with a 17th place designation. All of that aside, the Huskies had a successful weekend competing against quality opponents to better sharpen their skills for the rest of the season including the IHSA State Series. After completing a dual team tournament in Minnesota, the Huskies will jaunt to Wisconsin for another out of state competition. As luck would have it, the Cheesehead is slated to feature 32 high schools -- the same number as The Clash had recruited. The difference is that the Cheesehead is an individual tournament in place of a dual team derby. While OPRF had participated in Wisconsin tournaments before (think West Allis), I believe this is the inaugural Cheesehead Invitational for for Orange & Blue. It appears that the place of each weight will be wrestled out, similar to the Granite City Holiday Tournament in which the Huskies participated several years ago. Friday and Saturday's tournament will take place in Kaukauna, WI, at Kaukauna High School. Wrestling starts at 5:15 pm on Friday and at 8:30 am on Saturday. [UPDATE] After Day 1 | The Huskies have started strong and showed a few new faces in the fearsome fourteen. Clayton Smith (126) and Brian Ziech (220) are making their Varsity season debuts. After Day 1, OPRF sits in third place. The top four high schools are Montini (195.5 pts), Southeast Polk (160.0), OPRF (140.0), Kasson-Mantorville (135.0). Tied for fifth position are Kaukauna and Simley (119.5). You can follow the action by way of TrackWrestling below. Go Huskies! With Saturday's temperatures reaching a frigid -4 degrees Fahrenheit (as a high), the RCTC Regional Sports Center served as a heat shelter for wrestlers, staff, and fans. Inside the field house -- and outside of the cold -- the Huskies strutted their stuff on Day 2. Against three other Day 1 runner-ups, OPRF went undefeated and completed the tournament with a 5-1 dual record. In the afternoon/evening session, the Orange & Blue bounced Anoka (MN) 33-23, Simley (MN) 48-12, and Washington (IL) 43-18. OPRF's fifth win of the tournament was particularly satisfying as the Panthers had beaten the Huskies earlier this season (at OPRF High School). Let's take a closer look at these three duals. In what turned out to be the closest of OPRF's three wins on Saturday, the Huskies downed Anoka 33-23. In this matchup, the Tornadoes started strong. They took four of the first five bouts. Undaunted, OPRF stormed back by earning six of the next seven battles. The last two contests were split one team apiece. OPRF earned 8 bout victories to Anoka's 6. In the dual, two big bouts stand out. At 132 pounds, Eddie Bolivar earned a gritty 5-2 victory for three team points. The match of the dual took place two weights later, as Eddie Ordonez earned a heart-stopping tally in sudden victory fashion. Eddie's overtime takedown pushed the Huskies to a 23-20 lead with three bouts to go; a reverse fortune would have flipped an identical score to the Tornadoes. As it turned out, Anoka needed a tech fall or fall in the last match to win. Daemyen Middlebrooks (170) had other ideas and dominated in a tech fall win for the victorious Huskies. Against Simley, there was little need for worry. This dual began at 195 pounds, and the Spartans took a short-lived one point lead after the second bout of the dual. The Huskies hustled to five straight wins to push the team score to 29-6. Simley only managed two more bout victories in the matchup (at 132 and 160). The Orange & Blue Wrecking Crew lived up to this moniker by way of 11 bout wins to Simley's 3. A number of Huskies scored high bonus point victories. Ashford Hollis scored a pin at 285, and a number of Huskies also earned tech fall honors: Connor Nagela (106), Jake Rundell (113), Nico Bolivar (126), Torry Early (138), and Daemyen Middlebrooks (170). After the final whistle, OPRF had quadrupled up Simley 48-12. If I may be so candid, I was licking my chops in anticipation of the dual against Washington. It was due to be a great dual with the Huskies wanting to avenge a loss and the Panthers aspiring to go 2-0 versus Collins's Cadets. At 220 and 285, the Panthers and Huskies traded falls. A dozen bouts would decide this dual. After a Washington decision at 106, Jake Rundell, Josh Ogunsanya, Nico Bolivar, and Eddie Bolivar all earned hand-raises. Josh's match was razor close, as he and Christian Goin pushed the match into overtime. It was a late point against Josh that took it there, but in double overtime Josh saw himself down (in points and position) but reversed his fortunes in a 7-4 victory. Josh added two near fall points for good measure. A bit later, Joe Chapman and Jack Fisher each earned minor wins to push the lead to 31-15. At 170, Daemyen Middlebrooks put the contest out reach, and Elijah Osit -- who didn't wrestle in the previous Washington tilt -- concluded the dual with a forfeit win. The Huskies headed home happy: OPRF 43, Washington 18. On Day 2, Jake Rundell, Josh Ogunsanya, Nico Bolivar, Joe Chapman, Daemyen Middlebrooks, and Elijah Osit all finished a perfect 3-0. Eddie Bolivar, Eddie Ordonez, and Ashford Hollis all concluded their tournament with a 2-1 day. For the two day tournament, Jake Rundell and Josh Ogunsanya each tallied a 6-0 record, followed closely by Elijah Osit at 5-1. Finishing 4-1 was Nico Bolivar and Joe Chapman. Sitting at 4-2 were Eddie Bolivar, Eddie Ordonez, and Daemyen Middlebrooks. While the Huskies enjoy a Happy New Year (you too! ), they will prepare for action at the Cheesehead Invitational (Kaukauana, WI) in one week's time on January 5-6. The Clash is a yearly staple in Rochester, Minnesota. What better way than to ring in the new year than with one of the best dual tournaments in the country? The Huskies conclude 2017 with two days of action in Rochester, Minnesota, in what has become a winter trek in recent years. This is a 32-team tournament, with 8 teams competing in each of 4 brackets on day one. The place of each school in day one's bracket will dictate day two's round robin format of 4 squads each. For example, all four bracket winners (A, B, C, D) will go head-to-head on Saturday; all four 2nd place schools will lock horns; all 3rd place, etc. On day one, the Huskies wrestle in the morning session (9 am, 11 am, 1 pm). Note that while this tournament had 32 entrants, this year's Clash XVI will only feature 29 high schools. According to the preview below, there will be a 5-team 7th bracket and no 8th bracket this year (these two brackets are day two brackets). [UPDATE] After Day 1 | The Huskies dispatched the first two opponents but could not topple a third in the 8-team Bracket A tournament Friday morning and early afternoon. In the first dual of the day for the Orange & Blue, OPRF downed Frazee (MN) by a 37-24 tally. The Huskies cruised in their second challenge and defeated Ellsworth (WI) by a 42-18 score. In Friday's third and final competition for Oak Park & River Forest, the Huskies met #8-nationally ranked St. Edward (OH). The Eagles powered their way to a 52-12 victory against the Huskies. OPRF managed only two wins versus St. Edward: pins from Jake Rundell (113) and Josh Ogunsanya (120). Full Huskie results are located in the TrackWrestling link below, but note that Jake Rundell and Josh Ogunanya each went 3-0 on the day. Eddie Bolivar, Eddie Ordonez, and Elijah Osit also finished with a plus .500 record at 2-1. [UPDATE] Day 2 Preview | On Saturday, the Huskies battle three new high schools for final placing in the tournament. By way of their second place finish in Bracket A, OPRF will wrestle in the final day's 2nd Bracket. This day, remember, features a round robin style competition. Depending on the results of the duals, the Huskies will finish the tournament anywhere from 5th-8th place. The final day's duals will come on Saturday at 4 pm, 6 pm, and 8 pm. The opposing high schools, in order, will be Anoka (MN), Simley (MN), and Washington (IL). You may remember that Washington and OPRF tangled in a close dual earlier this season, which the Panthers won. The rematch, and the two lead-in duals on Saturday, will be exciting to say the least. Go Huskies! If you haven't heard much about the Rex Whitlach Tournament (also knows as the Hinsdale Central Tournament), you may be surprised to know that it's a dandy of an Illinois tourney. Twenty-four squads came and performed on the Red Devils' campus. Of the twenty-four, the Huskies finished number one. OPRF earned 266.5 team points en route to the gold trophy. Second through fifth were DeKalb (170.5), Providence (145.5), Sandburg (143), and Minooka (140). The Orange & Blue garnered 3 first place results, 4 second place, 1 third place, 2 fourth place, and 1 seventh place. The trio of champions included Jake Rundell (106), Josh Ogunsanya (120), and Eddie Bolivar (132). Runners-up were Nico Bolivar (126), Torry Early (138), Jack Fisher (160), and Daemyen Middlebrooks (170). The lone consolation champ was Elijah Osit (195). Full results are below. Note that the Huskies did not field a 113-pound grappler, nor did they enter Tony Madrigal who is a top-ranked lower weight. With these, OPRF certainly would have amassed several more team points. Earlier update | After locking horns with Glenbard West earlier in the week, the Huskies continued their western travels at Hinsdale Central. Despite missing a 113-pound wrestler in the Varsity tourney, on Friday night the Huskies have vaulted to the number one position at the Hinsdale Central Whitlach Tournament this weekend. DeKalb and Providence Catholic are second and third, five and eight points behind, respectively. You may remember these two high schools as they visited Scoville Avenue's campus just one week ago. Photo finish | Photos from Day 1 and Day 2 are posted on the Huskie Wrestling Family's Facebook page --> direct links: Whitlach Day 1 and Whitlach Day 2. For a complete bracket of this tournament, jump to ILWrestle's Whitlach bracket. Feel the buzz | OPRF Wrestling was featured by the Wednesday Journal. 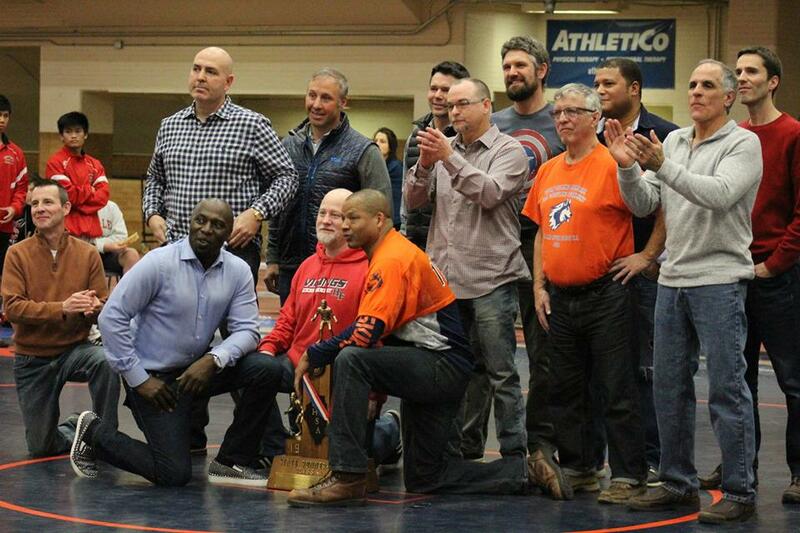 Click to read Marty Farmer's article dated December 12: OPRF Wrestling buzz better than ever. The men and women of the United States Armed Forces are unique, determined, and courageous individuals. On Saturday afternoon, two of this breed met shoulder to shoulder in Philadelphia to take in the on-field action. 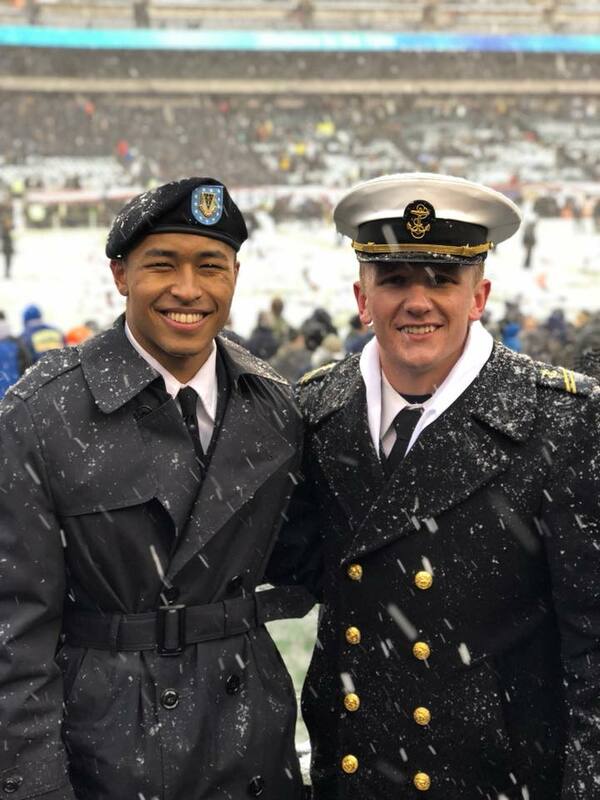 Kenzo Murray (Army), a 2017 OPRF graduate, and Andrew Borgdorff (Navy), a 2015 OPRF graduate, posed for the picture above. You may also remember former Huskie wrestler Michael Woulfe, a 2012 OPRF graduate, as a Navy Midshipmen grappler in recent years. Our thanks go out to these young people and to many others. Saturday brought a great day of wrestling, but sadly it brought the Huskies first loss on the season. The Orange & Blue dispatched of #11 DeKalb and HM Providence, but the Washington Panthers sunk their teeth into the Huskies. Washington is ranked #1 in Class 2A. In a tight affair, the visiting Orange & Black earned a 37-31 victory. This dual was a repeat result from a year ago when the visiting Huskies earned the W in "Dubtown." While Oak Park & River Forest would love a chance to avenge this defeat, the two teams will not meet in the State Series. However, both squads will enter The Clash dual team tournament on December 29-30. They may face off again. OPRF is now 12-1 overall and 3-0 in conference. Year in and year out, the Lyons Township Lyons hope to notch a win versus the Oak Park & River Forest Huskies. On the flipside, OPRF wishes to do the same against LT. These conference rivals have fought battles (some would say wars) against one another. On Friday night, the Huskies didn't need any luck or magic to best the Lions. The Huskies came out and controlled the dual. For the Varsity Huskies (10-0, 3-0 conference), the 58-18 victory continued the undefeated streak to begin the IHSA campaign. The dual began at 132 pounds, and there was an orange blaze from the get-go. OPRF scored team points of 5-6-5-6-6-6 in the first half dozen bouts to earn a sizeable lead. The Lions could not match the intensity or success of their foes, but they did earn match victories at 182 pounds, 195, and 220. In order, Huskie victories came from Eddie Bolivar (132), Tony Madrigal, Eddie Ordonez, Joe Chapman, Jack Fisher, Daemyen Middlebrooks (170), Ashford Hollis (285), Connor Nagela, Jake Rundell, Josh Ogunsanya, and Nico Bolivar. Fighting with Huskie Heart in losses were David Smith (182) and Talvin Gibson (220). OPRF offered a forfeit at 195 pounds. The full OPRF-LT box score is offered on Illinois Matmen (provided by Mainefan). The win was the Huskies' 11th straight victory against West Suburban-Silver Conference opponents. Every year around this time, the Illinois High School Association posts its postseason assignments for its three classes of high school wrestling: Class 3A, Class 2A, and Class 1A. As you can gather from this article's title, the assignments are out!! For the February 3 Regional, OPRF will once again drive out to Leyden High School. At Leyden, this year's crop of teams includes Addison Trail, Lane, Schurz, York, the host Eagles, Provisos East and West, Willowbrook, and our Huskies. On the following weekend, the Orange & Blue will compete at Larkin High School (Elgin) in the Individual Sectional. As you know, the Individual State tournament takes place on the subsequent weekend -- at the familiar home of the State Farm Center in Champaign-Urbana. 201 N. Scoville will host the four squad Dual Team Sectional on Tuesday night, February 20. In order for the Huskies to participate in said event, they will need to finish tops at the Leyden Regional. To view the full February grid, visit 2017-2018 Class 3A Assignments. From this page, you can click on the other two classes' information. Huskies are coming up gold. In case you were out shopping for the right holiday gifts this season and missed it, the OPRF Huskies are out and about themselves, dominating the competition who have crossed their paths. The Orange & Blue Wrecking Crew are doing just as this moniker describes. With victories over Downers Grove North, South Elgin, New Trier, Dakota, Schaumburg, Proviso West, Lincoln-Way West, Lockport, and Granite City, Oak Park & River Forest owns a 9-0 record on the season, including a 2-0 record in conference. For Varsity results thus far, visit our Results page. This weekend will be another fun one to look forward to; the Huskies will visit rival Lyons Township on Friday. On Saturday, the Orange & Blue will play hosts while hoping to yet again feast on the competition. That's right: the Huskies host a Varsity quadrangular meet on Saturday. In another bit of knowledge, none of the other six high schools in the West Suburban Silver Conference are ranked in the top 25 (as of this writing). That leaves OPRF as the only ranked team in conference, according to IWCOA / GEI Wrestling Apparel. For more on the current rankings, visit our Rankings page. To stay updated on our photos, please visit the Huskie Wrestling Family page on Facebook. The Huskies are back at it today and tomorrow. First, Oak Park and River Forest hosts Proviso West tonight. Tomorrow is an away event at Washington High School. For some it is a jaunt, but the wrestling at Washington should be very good, and not just in the Huskie duals. While you prepare for this weekend's action, we're thrilled to announce this season's sponsorship list!! Below are the sponsorship logos for 2017-2018 partners. For more information about each business or association, you can click directly onto the logo to jump to the official website. Thank you to all of our sponsors for their kind support! To the viewers, please consider these businesses and associations if you have a need or desire to do so. We invite you to visit the full Sponsors List at our Sponsors page. You can also view it by using the left menu bar and selecting "SHOW YOUR SUPPORT - Sponsors". If you wish to add your name to the list, further details are available on the Sponsors page. Thank you again, sponsors! Well, that was fun. Oak Park & River Forest posted the first 71 dual team points in their home win over the South Elgin Storm. You know about Twitter, so now why don't you take a jaunt to the Facebook Huskie Wrestling Family page? Dual results are there and photos (hopefully). Happy Thanksgiving to all! Enjoy your holiday but remember that Saturday holds an away quad at New Trier. Thank you to all who came out to Skrine Chops after the meet! Quicker note: the Roster page is...updated! We may update this page as the season progresses, but the roster names and photos are ready so that you can get to know your 2017-2018 Huskie wrestlers! The Huskies take down their conference opponent, the Trojans of Downers Grove North, in a one-sided affair. The Collins Cadets took 11 of 14 bouts to run away with the Varsity dual. For a full recap of Huskie wrestlers and results, visit OPRF Wrestling's Twitter page. Remember, the Huskies host South Elgin tonight! It will be Senior Night (and Alumni Night). Alumni Social (post event) | For those interested, there will be an Alumni event at Skrine Chops (7230 Madison Street, Forest Park) following the dual versus South Elgin. Even if you cannot attend the dual, you are welcome to join the drinks, food, and fun at Skrine Chops! Q: What do you get when you cross a Huskie and a Trojan? A: A conference clash to begin the 2017-2018 season! Welcome to the next step in the 2017-2018 journey. The Huskies (all levels) jaunt to Downers Grove and tangle with the Trojans. We hope you can come out to watch the Orange & Blue in action. The first -- unofficial -- competition took place this past Saturday in the intrasquad event at OPRF High School. A few photos are above. The young men and women are now champing at the bit to face a wrestler in an opposing singlet. Tonight they will get their chance. Quick note: the Roster page is updated with the names, but the Mug Book photos are in process and will be updated by this weekend at the latest. Now, we are mere days away from the opening competition bell (November 21 at Downers Grove North). The Huskie Coaching Staff put together a rundown of the Varsity lineup with predicted weights. If you are anything like me, you will be thrilled to read about these student athletes who will aid the squad in this year (and some in future years). In all, twenty-five wresters are mentioned. Nine of these are 2017-2018 seniors. The wheels are turning on this year's roster and mug book pictures, and we'll get them to you as fast as we can. For now, enjoy this read! Connor Nagela: Connor is a freshman at OPRF and is excited to be a part of the high school program. Connor came up through the Little Huskies youth program. He was an IKWF State Qualifier last year. Connor should gain some valuable experience this year working with our talented lightweights. Jake Rundell: Jake is entering his sophomore year after having a very good spring and summer. Jake finished 3rd in both the Greco and Freestyle Junior National Championships in Fargo, ND. Jake has a relentless style of wrestling and is always looking to score from all positions. We are excited for Jake to step into this starting role. Jake is currently ranked #11 in the country by FloWrestling. Josh Ogunsanya: Josh enters his sophomore year after earning All-American honors this summer. Josh finished 4th and 6th respectively in Greco and Freestyle Cadet National Championships. Josh will be returning to the starting lineup after missing the end of his freshman year due to injury. Josh is a true student of the sport and is constantly looking to improve his strength and skill. Josh is primed for an exciting sophomore campaign and is looking to have a full season of competition. Nico Bolivar: Nico is our third sophomore looking to start this season. Nico stepped into the starting lineup last year and did not disappoint. He ended up qualifying for the IHSA State Tournament as a freshman and beating some very good wrestlers along the way. Nico has dedicated himself this past offseason and is showing tremendous growth as a wrestler. Raymond Hernandez: Raymond is a freshman at OPRF. He will look to crack the lineup at either 120 or 126. Raymond finished 7th last year in the IKWF State Championships. Since the summer, Raymond has fully embedded himself in the Huskie Wrestling Family. He comes into high school with a lot of ambition; it will be exciting to watch him grow over the next four years. Eddie Bolivar: Eddie begins his junior year hungry for more. Eddie came up short of placing last year at the IHSA State Championships, but it provided great experience for him as a first year varsity starter. Eddie will compete at both 126 and 132 for the Huskies this year. Eddie is looking forward the start of the season and stepping into his own as a leader in our program. Torry Early: Torry is entering his junior year after a successful summer. He earned All-American honors at the Cadet Greco National Championships this summer. Torry has grown, literally he’s about three inches taller, but also with his training. Torry is extremely knowledgeable in the sport of wrestling and is disciplined with his game plans. Anthony Madrigal: Anthony is a senior who is committed to wrestle at Oklahoma University next year. With that monumental decision out of the way, Anthony can concentrate on improving himself as a wrestler and leader in the program. Anthony is a two-time IHSA State Runner-up and is looking to capture his first state championship. Anthony has committed more time to being a better teammate this offseason and season. His leadership will help push the younger wrestlers around him and bring them to a higher level of training. Anthony is currently ranked #5 in the country by FloWrestling. Joe Chapman: Joe enters his sophomore year and will compete at both 145 and 152 this season. Joe has put in countless hours since the end of last season. Joe’s willingness to put in the extra work exemplifies the ambition we preach in our program. Joe will continue building his confidence through his work and will continue to improve as a wrestler because of it. Eddie Ordonez: Eddie is another senior we are looking to as a leader. Eddie was one of three wrestlers from last year’s team to come up one match short of qualifying for the IHSA State Tournament. Eddie is looking to get the most out of his senior year, and his work in the room is showing it. Eddie is pushing himself harder than ever before, and his efforts are rubbing off on those around him. Kedrick Bryant: Kedrick enters his senior year bigger and stronger than last year. Kedrick learned a lot during his junior year when he sporadically filled in for others in the varsity lineup. Kedrick is another great student with a phenomenal work ethic. Kedrick’s been able to come a long way in a short amount of time through his efforts in the practice room and weight room. He is grateful for his opportunities in our program and is making the most of them. Jack Fisher: Jack’s junior year did not finish the way he wanted. He made a decision in March that he would not be outworked by anyone else. His determination to better himself as a wrestler and leader is showing throughout the program. Jack wrestles “Huskie Style” and is opening up his offense in all facets of his game. Jack will be looked to as a leader with a lot of younger middleweights around him. Danny Lingen: Danny is a sophomore in our program and a natural born leader. Danny is a vocal young man who pushes himself in all his endeavors. Danny will look to push his teammates and himself to get the most out of the time this year. He is a part of a solid sophomore group from which we are expecting big things moving forward. Ronnie Massari: Ronnie is a sophomore who received some varsity experience last year. Ronnie looks to build off his freshman year and his solid wrestling foundation. Ronnie’s commitment in the offseason helped prepare him for this upcoming season. Ronnie will compete for the spot at 160. Cameron Bates: Cameron is a senior and one of the best leaders in our program. His selflessness is second to none. Cameron always looks to help the younger wrestlers around him. He is the consummate team player. Cameron had a lot of success on the lower levels last year. He will look to finish out his career at OPRF as a leader and be championed for his efforts in the room. 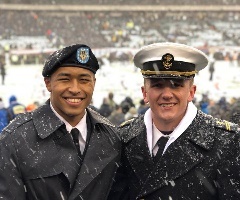 Jake Cagnina: Jake went all in for the offseason and was able to see some return on his investment by earning All-American honors this summer. Jake took 8th place in the Cadet Freestyle National Championships. Jake heads into his junior year with a renewed focus. He was able to wrestle 30 varsity matches as a sophomore; he built off that and had a tremendous offseason. Jake looks to hold down the varsity spot at 170 while improving his efforts in the room. Daemyen Middlebrooks: Daemyen is another sophomore who came up through the Little Huskies WC and is a dual-sport athlete. Daemyen is a football player and wrestler at OPRF. Daemyen is an explosive athlete who has built up his strength and endurance to better himself as an all around athlete. Daemyen has a new level of focus headed into this season. Ibrahim Mohktar: Ibrahim is a senior in our program. Ibrahim is an unbelievable young man who looks for challenges and embraces the obstacles in his way. Ibrahim will look to compete at 170 this season. He is an inspirational young man; his perseverance as a student athlete is unmatched. David Smith: David is a senior and is excited for his senior campaign. David began his wrestling journey three years ago as a freshman backup. David has worked his way into having an opportunity to represent the Huskies in the varsity lineup. David pushes himself and those around him on a daily basis. He is an ambitious student and wrestler. He’s worked tirelessly in all areas while stepping up as a leader. Elijah Osit: Elijah has gotten the most out of his experience at OPRF. After moving into Oak Park going into his sophomore year, Elijah has transformed himself into a strong, confident young man. Elijah’s junior season had many ups and downs. With his best efforts, he will look to continue his progress as a man and wrestler. Elijah has set himself up to be the leader we know he can be. Brian Ziech: Brian is a junior who transferred from Fenwick High School. He was a sectional qualifier for the Friars and will be looking to break into the lineup at 195 or 220. Brian is a big strong young man and will be working on refining his technique to improve as a wrestler. We are excited to add another experienced big guy to the room. He brings a lot of positive energy and coachability. Talvin Gibson: Talvin enters his senior year after starting on the offensive line for the OPRF football team. Talvin gained a lot of experience his junior year and wants to get the most out of his senior year. Talvin’s toughness allows him to wear his opponents down. It’ll be crucial for Talvin to improve on his technique in order to get to the next level. He will be pushed by the younger guys, and we know he will respond the right way. Jaylan Pascasio: Jaylan is in his third year with the wrestling program. As a sophomore, Jaylan had a lot of success on the lower levels. Jaylan competes hard on a daily basis. He is a young man of few words, but his level of toughness and tenacity shown in his wrestling speak volumes. Ashford Hollis: Ashford is a junior coming off All-Conference honors as a defensive lineman for the OPRF football team. Ashford has come on strong since last season and built himself into a legitimate heavyweight. His strength and conditioning have improved over the course of the past half year. Ashford looks to build off a very impressive football season and solidify the top weight of the lineup. Max McDermott: Max is a senior in our program. Max has had an interesting career at OPRF to say the least. He’s battled through many things and is working his way to becoming a self-sufficient young man. Max will help push the other upper weights in the program, and he is good to have in the room on a daily basis. We are excited to have him back with us full time. Thank you for your patience as we churn and churn in preparation of the competition calendar for 2017-2018. "Competition calendar," did I say? Oh, yes. Here is an overview of the events with commentary and team/event websites. If anything needs correction, please contact us. You'll notice a few things when scanning below. First, the Huskies will host a quad on December 9. No need to hold in your excitement; no need to miss the event either. Also, OPRF traded The Ironman tournament for The Cheesehead. Both are individual invitationals. Other than these tidbits, most everything looks the same as last year. Enjoy, and mark your calendars! (Written commentary by Brian Tideman, webmaster) | Any updates or fixes with team emails, contact us. Since 2012-2013, the Huskies have opened their competition schedule against the intraconference foes Downers Grove North. Every year, it seems, the Trojans push to be considered in the top half contenders of the WSC-Silver. If you want to see the fresh faces on the year as they happen, Downers Grove is the place to be. Last year, the Huskies defeated South Elgin 78-0. This year, the Storm would love to return the favor, but they'll first aim to earn some bout victories and go from there. After this event (the night before Thanksgiving), there has traditionally been reunions, conversation, and fun. Keep your ears open. It's been New Trier, Dakota, and Schaumburg for the last few years; expect the same. Dakota has been a Class 1A powerhouse within the last several years. Some of their wrestlers have been flat out dynamite. Come and see for yourself how they fare against a trio of 3A squads. If you can remember the last time that Proviso West defeated OPRF in a dual, you deserve a prize. Don't sleep on some of the Panthers; there are a number of talented athletes that walk the halls in Hillside. Finding 14 Varsity starters has been a problem for the Cats. 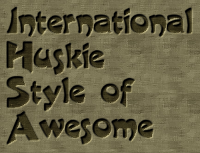 Last year, the Huskies defeated Washington in the "Dubtown Throwdown" event. This is not a one-on-one dual, but you very well may see the Huskies take on these Panthers. 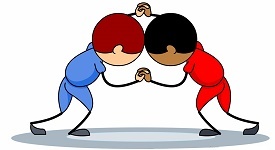 If so, expect camaraderie -- along with competition -- to take center stage. What can we say about LT? The Lions and supremely coached -- hint, hint -- had dreams and nightmares against us (or is it the other way around?). Whether it's close or a distant victory for one side, an OPRF-LT matchup is always a bona fide marquee attraction. The Huskies added this home date to their schedule, and I'm not quite sure who will make the trek to 201 N. Scoville. That adds to the excitement, though, doesn't it? There is no excuse not to come out to OPRF on December 9; we've brought the party to you! In Illinois high school athletics, the football Hilltoppers are synonymous with football winners. Of late, Glenbard West's wrestling squad has taken some steps forward. They are always tough against non-conference opponents, but they, like the Trojans, stride to perform consistently in conference. The Orange & Blue Wrecking Crew dominated last year's Whitlach tournament, besting 23 other schools to win the crown. Will it be the same this year? This is a dandy of a tournament. If you have time, come out for Friday and/or Saturday. If you like tournaments, and you like duals, this is your heaven. Rochester, Minnesota, hosts a 32-team dual team tournament that holds a nice mix of intrastate and interstate talent. OPRF's best finish here was in the 2014-2015 season when the Huskies won the tournament title en route to an undefeated dual slate, a Class 3A team title, and an end-of-season number 1 national ranking. Now, that's a season. The Huskies waved a magic wand and replaced The Ironman tournament with this one. While The Ironman has national buzz, this is another 32-team tournament with regional appeal. Wisconsin, as you'd imagine, is represented here much like Minnesota is represented at The Clash. This year will be OPRF's inaugural at The Cheesehead (Kaukauna, WI). Our (mostly) North Avenue neighbors have sputtered recently, at least in terms of conference standing. The Dukes are hoping for a return to the form of the 1990's and 2000's when it was not surprising to see a York team progress well in the IHSA State Series. We gave "ink" to Lyons Township, but Sandburg is another beast of an opponent. Wars were waged between the Eagles and Huskies. This is a "Super Duals" event, so expect many teams to arrive. 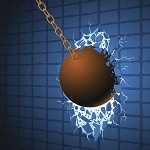 However, due to the logistics of competing against all others, the Huskies will lock horns with only a select few. Understanding Hinsdale Central's wrestling squad is mired in intrigue. About a half decade or so ago, the Red Devils were putting their place on the Illinois map. They've had some struggles recently, but they very well may be righting the ship to put the Illinois population on notice. I think the expression is, "The toughest little tournament in the country." I wrote these words two years ago in my similar preview, and I'll leave them here. What is fantastic about this tournament is that it brings in squads from all over. It's a really unique collection of talent and styles. You want to be here. OPRF's regional, sectional, and team sectional (for team qualifiers) sites are yet to be determined. You can be assured, though, that when it comes to February, all Class 3A schools do not look forward to locking arms with the Orange & Blue. The Huskies will be prepared to wrestle six grueling minutes (eight and a half minutes if need be) to get the job done. The state series culminates in in Bloomington, Illinois (shout out to the Fightin' Titans! ), at the US Cellular Coliseum. Let's dance: The IHSA season has commenced! Hello, everyone! Welcome to another grand season of IHSA and OPRF Wrestling! On Monday, November 6, the Huskies (instructors and pupils) began their quest in what will be a terrific journey within the halls at 201 N. Scoville, among a number of other secondary schools in the Chicago area, and inside a few interstate facilities. Here at OPRFWrestling.com, we will get you ready for the first whistle -- Tuesday, November 21, at Downers Grove North -- with loads of information about this year's crop of student athletes. Prior to the DGN WSC (Silver) Conference tilt, expect to see 2017-2018 coaches, rosters, previews (schedule and wrestler), wrestler photos, and rankings (likely to be released by then). We have already updated our Schedule page. As the season progresses, we will update wrestler statistics on the Varsity level, as well as dual and tournament results for Varsity. As I write this, be aware that I am one person. While a (large, devoted) team works tirelessly and selflessly to make OPRF and Little Huskie Wrestling the very best they can be, I alone type these words on this computer, to be uploaded later. If you have any news to share, any clarifications to point out, or even if you just want to say, "Hey, cool site! ", please contact us/me. I appreciate any and everything I get. I am thrilled to be a part of this website, of this team, of this greater community, of this sport, and of this time in history. Let's all share a terrific season together, just as we have for years and years and years before. In relentless pursuit and Huskie pride. Parents' Night | This Monday, November 13, there is an OPRF Wrestling Parents' Night at Oak Park Brewing Company. Come out and support the team/establishment! As the leaves change color and the cold winds begin to blow, Illinois High School Association Wrestling hustles back to the Land of Lincoln. It was just over nine months ago (in late February) when the IHSA Wrestling Season concluded for the Huskies and for all of the high school teams in the state. Monday marks the beginning of a new chapter, a new journey, a new thrill ride. Some will argue that these "new" adventures have already begun for some (or for all). 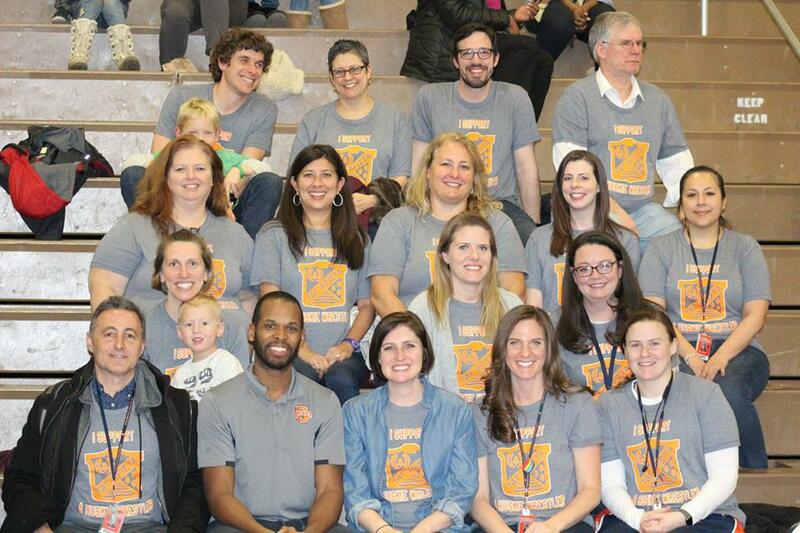 In the Oak Park and River Forest community, pursuit is relentless and family is omnipresent. It takes a village, and all of us in the Huskie wrestling program are honored and moved that we have and have had scores and hundreds (and thousands) of unique, passionate, and dedicated individuals to make "Those things that are best" even better. Let's take a brief look back. 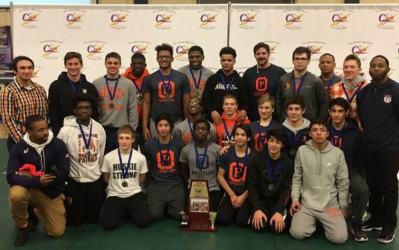 Coming into 2016-2017, the OPRF Huskies had won three consecutive Class 3A Dual Team Championships. In 2017 February, the Orange & Blue reached the final day of competition but fell in the Class 3A Dual Team State Quarterfinals. For the 2016-2017 season at a glance, visit our corresponding Results and Postseason pages. The Scoville Scurriers come into 2017-2018 with new faces stepping up, both in leadership and in levels. You can be assured that the wrestlers and coaches will be "Huskie hungry" to impose their dominance each and every time they toe the line in anticipation of the primary whistle. It will also be a season of growth, where young men and women develop in areas outside of the statistics of wins and losses. It will be the Orange & Blue Wrecking Crew as actors in unison to pursue relentlessly and to embody what it means to live Huskie proud. We're only a few short days to the beginning of the 2017-2018 IHSA Wrestling Season. Like a rubber band cocked back in preparation for flight, so too will be this year's crop of athletes...in mere days. If you're looking for reading material, may we suggest you take a look at last year's "28 for 28" series? In it, the Webmaster (charming guy, that one) offers 28 stories that help you understand a variety of facts and topics about Oak Park & River Forest's wrestling program or about high school wrestling in general. We want you to be as prepared as you can to maximize your enjoyment of the upcoming season. If you haven't clicked on the page, please do. It's comprehensive, informative, and dare I say quite helpful. Despite the year turning, nearly all of the articles continue to apply today. You may be asking yourself, "Okay, but when do we get the good stuff about the season?" Well, we'll get you ready for the site with previews, roster updates, and more. As the rosters are finalized (remember that wrestlers report for IHSA practice this coming Monday), we will begin to pen those exciting trailers or lead-ins to what will undoubtedly be yet another great season to remember. As we sign off for now, let us leave you with a phrase that I used in my "28 for 28" series last year. In the first post in the series, I wrote a sentence that resonates with me. I hope it resonates with you, too. "There is nothing more true...than the Orange & Blue." We'll see you again soon -- and you'll see us for a thrilling and fulfilling 2017-2018 season. Go Huskies! It has been a long end of the summer and now beginning to fall. All around Chicagoland (and all around the world), school life has begun to take hold on families, students, and staff members alike. We all know the sequence well: as the summer closes, school and high school football arise. As football's regular season exhausts, high school wrestling is waiting directly offstage. We are six -- SIX -- weeks into the IHSA football season, and Team Orange & Blue sports a 4-2 record. Let's support them as they aspire to enter and to do damage in the playoffs. OPRF's final regular season gridiron battle will take place on October 20. The official IHSA Wrestling season is allowed to begin on November 6, just two weeks and change after Week 9. If you haven't yet planned your winter sport work exit routine on Friday nights or perhaps where you'll stop for a coffee en route to a Saturday wrestling quad or tournament, don't worry. I have good news for you; you have time. As of this writing, there are almost 5 full weeks of anticipation until grapplers can roll around at 201 N. Scoville as official entrants in the 2017-2018 IHSA Wrestling Season. After November 6, the first contest will take place at Downers Grove North on Tuesday night, November 21. The wheels of wrestling are turning!